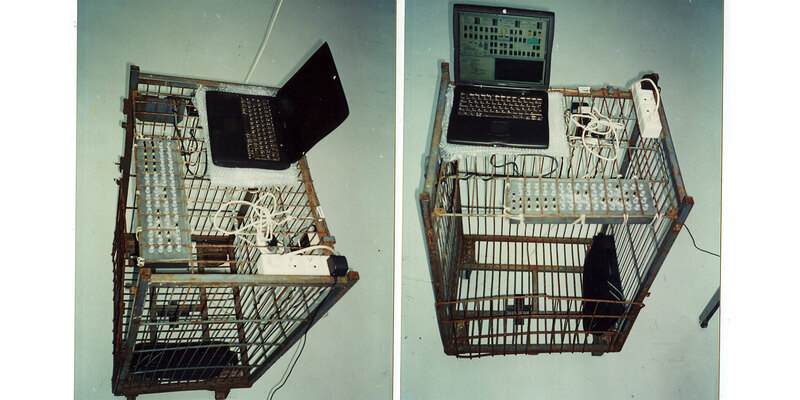 The very first performance of Gerhard Behles and Robert Henke as Monolake took place at a club called Friseur der Botschaft in Berlin, on July 26th 1996. The venue was an art project located in a squatted house near Friedrichstraße. The Monolake tracks Lantau and Macau have been created during this live set. Now it's all concrete and glass and shopping malls in that area of town. Photos above from a Monolake show ca. 1997 at the Contemporary Art Centre in Vilnius, Lithuania. February 25 Germany Hamburg Monolake Live Pudel . November 20 Great Britan London Lasers for Cosmic Pulses Barbican . Aug 21 ZA Johannesburg Monolake . Sept 18 AT Vienna Dust . Jul 08 US San Fransico Monolake versus Deadbeat . Sept 29 NO Stavanger Monolake Ghosts . Sept 28 NO Trondheim Monolake Ghosts . May 04 SI Ljubljana Monolake Ghosts . Apr 20 US Seattle Layering Buddha . Nov 22 PL Poznan Layering Buddha . Oct 18 RS Belgrade Termulator X Live . Jan 21 AU Melbourne Monolake . Nov 7 TR Istanbul Monolake . Nov 2 DK Copenhagen Monolake . Aug 25 LV Riga Layering Buddha . Feb 17 BE Leuven Studies for Thunder . Mar 4 CH Geneva Monolake . Jul 7 GB Manchester Monolake . Apr 07 DE Frankfurt Monolake ..
Mar 18 MK Skopje Monolake ..
Sep nn DE Berlin - Montreal Atantic Waves, w/ Deadbeat ..
Sep nn DE Strahlsund-Montreal Atantic Waves, w/ Deadbeat ..
Nov 25 JP Nagoya Monolake . Oct 3 US/DE Berlin - New York Atantic Waves w/ Deadbeat . Ju 22 BE Gent Atantic Waves w/ Deadbeat . Feb 08 CA Toronto Monolake 794 Bathurst St.
Feb 07 US New York City Monolake Filter 14, 432 W 14th St.
Aug 16 US Detroit Monolake Detroit Contemporary, 5141 Rosa Parks Blvd. Aug 14 US Brooklyn, NYC Monolake . Jul 31 JP Kyoto Monolake . Feb 10 CA Toronto Monolake . Oct 23 JP Kyoto Monolake . Mai 27 GB Newcastle Monolake . Oct 15 CA Montreal Monolake . July 27 DE Berlin Monolake Friseur der Botschaft e.V.